I am making a request with a custom filter that includes the "comment_count" field of the question type. My custom filter is !RtdMEtslKF6Z()NqpDUFZ58R6twu-.4V48gn0furqA*7_BL1. However, when I'm querying the question having an ID of 14585943, which has no comments (at this date), the field "comment_count isn't returned by the API. It should be returned, even if there are no comments, because the documentation doesn't specify that this field "may be absent". I tested this with the even simpler filter !.UE46pK5nV.kgRss, which includes no fields, except .items, question.comment_count and question.title. The comment count still isn't returned (when the title is correctly returned). "comment_count" is correctly returned (with the correct count) by both filters above if there are comments on the question. "comment_count" is always correctly returned if the filter used consists of the default filter, added with question.comment_count. 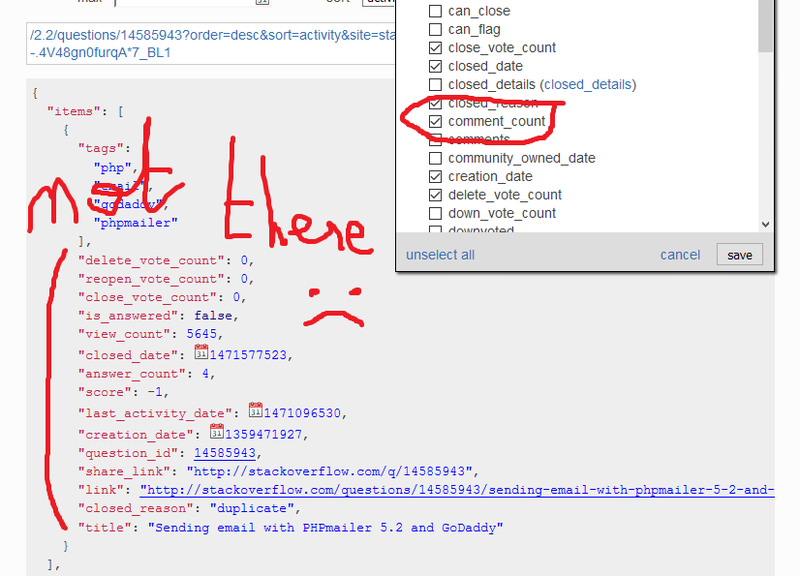 In this request, the result has "comment_count":0 for questions without comments. As such, it appears that the problem only happens when there are no comments and specific fields aren't included in the filter. (I am not sure which specific fields -- I tried to isolate to a single field but wasn't successful). This appears to be closely related to the bug: Why is comment_count=1 (incorrectly) when this particular filter is used?. appears to work in this case too. Not the answer you're looking for? Browse other questions tagged bug questions api-v2.2 comments filter .